DALLAS, TX — Florida Tile opened its newest designer showroom concept and warehouse, a 15,000-square-foot facility in Dallas, with a VIP reception at the showroom March 27, 2013. 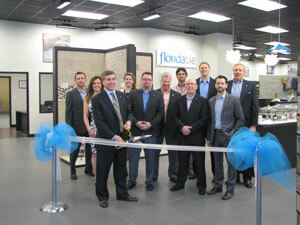 Michael Franceschelli, CEO of Florida Tile, cuts the ceremonial ribbon at the official opening of Florida Tile’s newest showroom and warehouse in Dallas on March 27, 2013. The 15,000-square-foot facility is a new concept featuring an extensive design center. Two hundred people attended the opening and VIP reception, including the Dallas District #8 mayor, Italian Consul and president of the local Chamber of Commerce. With Franceschelli is the Florida Tile team responsible for the new showroom and warehouse. Located at 9755 Clifford Drive (near Love Field airport), the Florida Tile facility is a re-purposed and re-designed structure featuring 9,700 square feet of warehouse, a 4,000-square-foot customer showroom and display area, a 700-square-foot contractor sales showroom, and more than 500 square feet comprising meeting and conference areas. The opening ceremony included remarks from Michael Franceschelli, Florida Tile CEO; Luca Setti, Senior Executive Vice President Branch Sales & Organization; and officials of including Honorary Italian Vice Consul, Vincenzo Enrico De Nardo (former consul for the State of Texas); as well as the Dallas District 8 mayor and President of the local Chamber of Commerce. Approximately 200 local business and government officials and guests attended.